At last Rodriguez arrived and I was going to see a show by the Man. It was with a bit of uncertainty that I went to the show. I wanted to go, but I also didn’t want to go. The thing that struck me was how mellow the people were, there was no pushing at the doors to get in, there was a nice steady flow into the arena. People from all walks of life were there. In the audience I saw serious new wave ravers (the one’s who cut their hair except for a little lock on the front of the hairline), also there were old guys with bald heads. I could not believe that Rodriguez had such a wide spectrum of followers. When he came on the crowd went wild. The same type of reaction as at recent, very well known bands concerts. As the songs were sung the people sang with him and they vibed to the sounds and the music. The jazzing up of “Climb up on my Music” was brilliant and could do well as a mix for the dance floor. 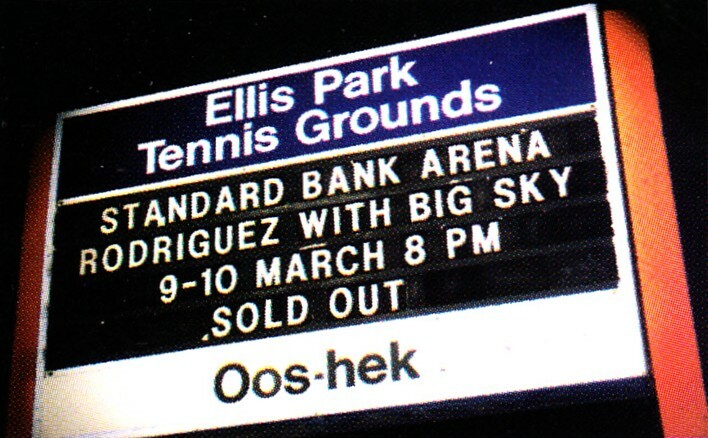 It seems that Rodriguez is such a NICE person he would rather give limelight to his support band than hog it himself. He came across as an absolute gentleman and unaffected by the hype. My overwhelming feeling as I left the concert was one of peace and fulfillment, here was a person whose music stood the test of time and was honestly grateful that we paid money to see him perform. Long live Rodriguez!! I hope you do very well.